SHOULDER | GEORGE D. GOUDELIS MD. Ph.D. The shoulder is an elegant piece of machinery. It has the greatest range of motion of any joint in the body. However, this large range of motion can lead to joint problems. 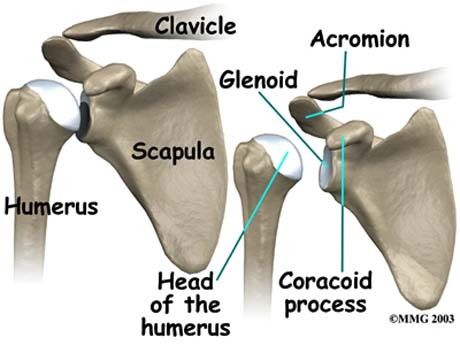 The shoulder is made up of three bones: the clavicle (collarbone), the scapula (shoulder blade), and the humerus (upper arm bone) as well as associated muscles, ligaments and tendons. The rotator cuff is a group of four muscles that surround the humeral head (ball of the shoulder joint). The muscles are referred to as the "SITS" muscles: supraspinatus, infraspinatus, teres minor, and subcapularis. The muscles function to provide rotation, elevate the arm, and give stability to the shoulder joint (glenohumeral joint). The supraspinatus is most frequently involved in degenerative tears of the rotator cuff. More than one tendon can be involved. 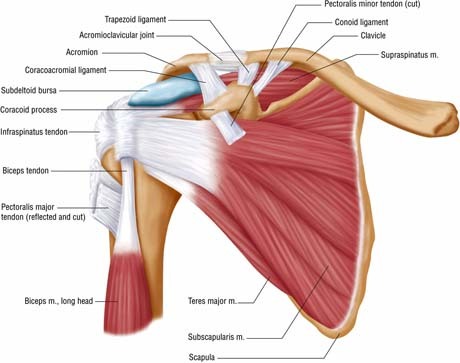 There is a bursa (sac) between the rotator cuff and acromion that allows the muscles to glide freely when moving. When rotator cuff tendons are injured or damaged, this bursa often becomes inflamed and painful.